For more photos and details see 1886 Aquetong Road. To arrange a private showing, call the John McClintock Team at 267-759-9518. George Nakashima [†] began his professional career as an architect, working at the vanguard of International Modernism in Japan before turning to furniture design. Thus as a trained architect, George Nakashima is also responsible for the design and construction of the structures that comprise the Nakashima Woodworker complex, erected between 1946 and 1982. Nakashima is appropriately compared with prominent craftsman such as Wharton Esherick and Sam Maloof. His work expresses a worldview that is based upon a unique set of circumstances including his formal education in architecture, his exposure to European Modernism, eastern religious philosophy, and traditional Japanese craft traditions, including instruction from Issei carpenter Gentaro Hikogawa while confined to a Japanese-American Internment Camp. As a testimony to George Nakashima's skill and national prominence, he was awarded the American Institute of Architect's Craftsmanship Medal in 1952. George Nakashima began his professional career as an architect, working at the vanguard of International Modernism in Japan before turning to furniture design. 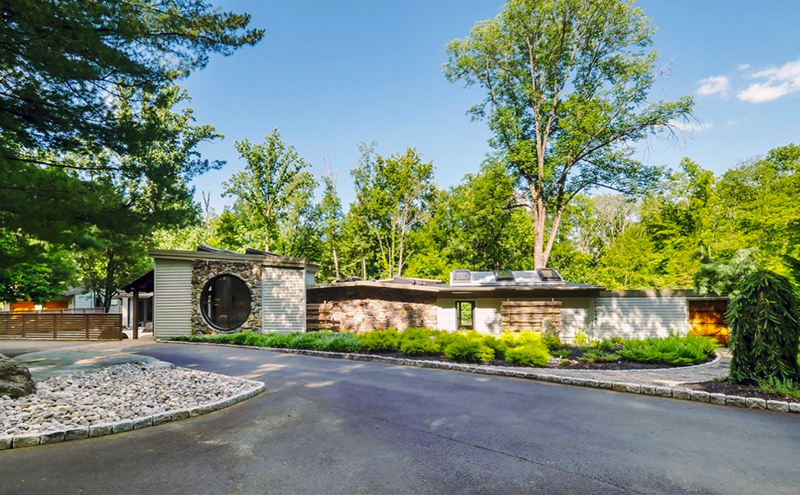 Thus as a trained architect, George Nakashima is also responsible for the design and construction of many structures in Solebury Township, erected between 1946 and 1982. His style intermingles elements of traditional Japanese architecture and the innovative use of different materials. Pure examples of the International Style are fairly rare, and these structures reflect Nakashima's exposure to some of the early pioneers of the style that gave birth to the Modern movement in architecture. Most notably, Nakashima worked in Japan with Antonin Raymond who was a protege of Frank Lloyd Wright and is generally considered to be a father of Modern architecture in Japan. While Nakashima's skillful and innovative approach to architecture is manifested in the buildings that he designed for his New Hope complex, examples of his work in the United States are extremely limited. In fact, his transformation from architect to furniture designer was primarily a reaction to American architectural practice in the mid-twentieth century, which he found antithetical to his earlier experiences in Europe and Asia. Nakashima embraced the hallmarks of the new International Style, such as its simple forms and clean lines, open plan, and expansive glass—elements often made possible through the plasticity of concrete construction. To this he added authentic elements of traditional Japanese building. † Adapted from: Historic American Buildings Survey (HABS PA‑6783, 2012), memory.loc.gov, accessed July, 2018. Browse more than 1,800 Bucks County Homes For Sale. To arrange private showings contact the John McClintock Team at 267-759-9518.